Nothing has been traced of the origins and early life of David Bellamy Hughes, who was born c1826 judging from his stated age at death, and who was clearly established in Sydney by the mid-1850s. Along with a number of the 1860 Woollahra councillors, David Hughes was an auctioneer, working through a network of importers to offer diverse consignments of goods to 19th century Sydney. Hughes was in partnership from c1853 with Henry Chatto of Redfern, the business trading as Chatto & Hughes, auctioneers and commission agents, and based at 400 George Street. The earliest advertisement placed by the firm in the Sydney Morning Herald appeared in the issue published 11 November 1853, in which the partners announced that an auction sale would be held at their Mart to offer ‘books, soaps, life preservers, Wellington medallions, ironmongery, tinware, stationery, drugs and sundries’ to their public - to which list was added, ‘and at 12.00 o’clock, Flour’. The late 1850s and early 1860s appear to have been the peak years of activity for the business. In November 1863 the partnership of Chatto & Hughes was dissolved. Henry Chatto carried on the business under the name Henry Chatto & Company. The moves of David Hughes immediately following the dissolution of the partnership are uncertain, but he appears in the years before his death to have been part of the firm of George Chisolm, a well-known Sydney draper. The names of four children – Harold, Edith, Ethel and Marion – born between 1857 and 1864 to David B Hughes and his wife Agnes, are listed in the indexes to Birth registrations for New South Wales. The earlier birth of their eldest child Agnes, pre-dating civil registration, is recorded in baptismal registers. Only one of these children survived their father – Walter Hughes, the youngest, who died in 1921 aged 57. Agnes died aged one, Edith at age four, and neither Harold nor Ethel survived beyond their twenties. 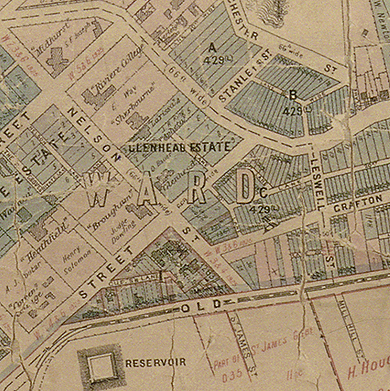 Footprint of Glenhead, municipal map of Woollahra, 1890. On 2 October, 1856 David Hughes took up a 99-year leasehold to allotment 38 of the Point Piper estate – an area of 2 acres, 1 rood and 38 perches. The land parcel, as shown in a plan of leasehold properties scheduled to secure the marriage settlement of Daniel Cooper and Harriet Grant Suttie, was bound by Nelson and Wallis Street, Edgecliff Road and Lot 37, the leasehold of John Goold. Here Hughes built his family home Glenhead, which still stands, preserved by its use for a succession of institutional purposes in the later 20th century. The building was sited close to the Nelsen Street frontage, on the north-western corner of Wallis and Nelsen Streets. The present day address is 23 Nelsen Street. David Hughes was settled in Woollahra by 1858, when the first issue of the Sands Sydney Directory was published. In that issue, Hughes is listed as a resident of Waverley Road Woollahra, a name once applied to that section of present-day Oxford Street which lies between Centennial Square and Nelsen Street. However it is likely that the entry for Hughes in the 1858 issue is a reference to his occupancy of Glenhead, since the Directory’s listing for Hughes’s neighbour, John Goold, also uses the descriptor Waverley Road. Subsequent issues of the Sands Directory record the Hughes household at Nelsen Street for the ensuing nine years, but by the time of his death in January 1868, Hughes had moved from Woollahra to Burwood. In April 1867 the 88-year residue of the lease to the Glenhead property was offered for sale at auction through Hughes’s former fellow councillor on the first Woollahra council, John Valentine Gordon. Advertisements for the 1867 auction give insight into the scope and quality of Hughes’s property. Glenhead is described as ‘a very pretty cottage residence, with about 3 acres of land laid out as a flower garden, shrubbery and grassland’. The house, ‘substantially built of stone’, consisted of entry hall and back hall, drawing and dining rooms and 5 bedrooms. Weatherboard outbuildings housed the kitchen, store, servants’ room, stable, and coach-houses. Much was made of the view (over the Double Bay valley and across the harbour to the ‘picturesque North Shore’ and Manly beach), to the benefits of omnibus transport past the property, and to the proximity of ‘other first-class residences’ in the area. Glenhead remained a private house until the late 1920s, when it was acquired by Karitane Home Ltd., part of an expansion into Australia of the services of the New Zealand-based mothercraft foundation the Karitane Society, set up by medical specialist Dr Truby King in 1907. More recently the property has housed Hughlings Private Hospital, and since 1990 the property has been part of the Montefiore Aged Homes network, re-named as Woollahra Manor. In terms of the history of Woollahra Council, David Bellamy Hughes made little impact upon the organization he briefly served. Nominated by John Davis and Samuel Studd on 21 May 1860, Hughes was the ninth councillor declared elected at the ballot held to determine the first council on 28 May 1860. His name had earlier been put forward as a prospective representative, with the backing of John Davis and Thomas Seabrook, at a public meeting held at the Victoria Inn, 9 May 1860. His two supporters each lived in the same general area as Hughes. At both this meeting and the official poll, Hughes was the recipient of just 41 votes, the lowest number collected by any of the successfully elected members of the new council. Moreover, as was the case with the election of Richard Holdsworth, had not the initial process of open voting been overturned by a call for a secret ballot, Hughes would have not secured his place – losing to one of those candidates (James Kingston, Andrew Lenehan or Alfred Toogood) who were declared elected on a show of hands, but who failed to replicate this success at the ballot box. Once elected, Hughes served only eight months on Council, retiring on the 12th February 1861, when he was replaced by William Thomas. Of the 1860 councillors, only Thomas Bowden served for a shorter period. Hughes’s name features only sparingly in the minutes of council meetings recorded during the eight months he served, and he appears not to have exerted any special influence on the decisions made, nor steered the council towards particular initiatives. David Bellamy Hughes spent the final year of his life as a resident of the Burwood area. He died in January 1868 at 42 years of age, a brief death notice published 2 February 1868 in the Sydney Morning Herald, noting the date of death as 14 January – at variance with the date of death recorded with official details collected for the processing of probate (10 January 1868). No funeral announcement has been traced in the Sydney newspapers. The Herald death notice indicates that Hughes died in Burwood, consistent both with the last place of address found for him in the Sands Sydney Directory published for 1868, and also with the registration of the event in the Concord district. Probate was granted on his will on 26 February 1868.